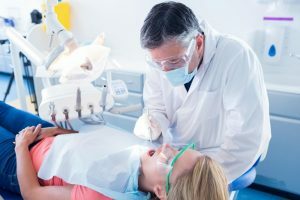 Scaling or root planing is the process of cleaning between the gums and the teeth, thus, eliminating the disease-causing bacteria lingering in these spaces. During this process your La Grange dentist will remove the tartar and plaque from gum pockets and this will promote healing of the gums. If tartar and plaque from gum pockets are left untreated, gums may become inflammed, a dental condition known as gingivitis. The bacteria can even go deeper into the gums, thus resulting to a more severe gum inflammation that destroys the supporting structures of your teeth such as the bone and ligaments. Once the bone and ligaments are damaged by bacteria, it cannot grow back making the tooth loose. This condition known as periodontitis, a more serious and destructive form of gum disease. Scaling and root planning will be recommended by your dentist as both a preventative measure and as a stand-alone treatment. If in your dental exam periodontitis was detected, this treatment will prevent the gum disease to further destroy your teeth. Prevents diseases – oral bacteria that causes periodontal infections can travel via our bloodstream to other parts of our body. Several research proved that lung infections and heart disease are linked to periodontal bacteria. Scaling and root planing removes this bacteria and stops periodontal disease from progressing, thus preserving your overall health. Protects teeth – the deeper your gum pockets the more risk of periodontal disease because of the presence of colonies of dangerous bacteria. Severe gum inflammation will destroy gingival and bone tissue and eventually lead to tooth loss if not treated right away. Aesthetic effects – scaling and root planing removes tartar and plaque from the teeth and below the gumline. And if superficial teeth stains are present, they will be removed in the process of the scaling and root planning procedure. Better breath – one of the most common signs of periodontal disease is halitosis or bad breath. Food particles and bacteria can cause a persistent bad odor in the mouth which is resolved with cleaning procedures such as scaling and root planing. Ready to have healthier and beautifully confident smiles? Call us today at (708) 482-4420 to schedule an appointment.